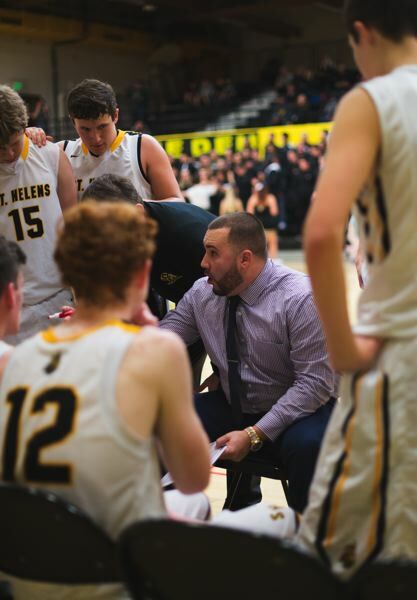 Game 5 of his first year as St. Helens boys basketball coach was not what Zach Waldher had in mind. The Lions failed to get on their first win streak, following up their Dec. 11 victory at Glencoe with a 46-36 home-floor loss to Rainier. "I wasn't happy," Waldher says. The team went straight from the game to the adjacent gym for about 90 minutes of conditioning and miscellaneous basketball work. "We didn't play hard enough in the game," Waldher says, "and we needed to have a little bit more attention to defense." The loss dropped the Lions to 1-4 going into a stretch of holiday-time games. St. Helens traveled to Redmond for a game against Ridgeview. Next comes a Dec. 28 game against visiting Reynolds and then home games on Jan. 2 versus Hood River Valley and Jan. 4 with The Dalles. That gives St. Helens three more games to get ready for the Class 5A Northwest Oregon Conference season. "Our problem is we don't have consistency," Waldher says. "League will be tough, so we've got to work and get better." Hence things like the back-to-work approach so soon after the loss to Rainier. "The boosters were shocked, but I'm not a guy who's going to allow that kind of outcome and effort to be acceptable," Waldher says. "I have high expectations for the kids and the program. "Our problem is this started when they were young ... they've consistently lost and think that's acceptable. "We're at a point where the culture is what we're focusing on, and right now that includes dedication to the program. "It was very frustrating Friday because we had put together a good week of practice, and we had a great crowd; our student section was awesome. But we need to play well to keep them coming and supporting us." Rainier, coming off its 3A football championship season, improved to 1-2, after losses to Portland Adventist Academy and Catlin Gabel. Rainier guard Joey Tripp and basketball center/football lineman and NCAA Division I prospect Easton Crape, 6-5 and 270 pounds did much of the damage against the Lions. "Tripp killed us. Seventeen points. He's just an elite level competitor," Waldher says. "Their big guy had 13 rebounds — didn't score a lot, but he was a force in the middle and altered our shots. "And they just out-physicaled us in our home gym. "But it wasn't their defense so much as that our guys were uptight, we didn't come ready to play, we weren't focused, we weren't accountable." On the positive side, Waldher liked what he saw out of players such as junior guard Canon Beisley and sophomore forward/wing Kyle Gundersen. "Beisley played well. He had a great spin move that had the crowd on its feet," the coach said. "And Gunderson played hard and got seven points in 13 minutes. He's doing the right things. He had a run in the first quarter to get us back in the game."